Just slide the wide footplates under the load, turn on the blower, and the load is lifted. You can move the load literally with the touch of a fingertip! The Air Lifter system speeds-up appliance removal and installation, saving you time and reducing the risk of back injuries and of damaging new floors. 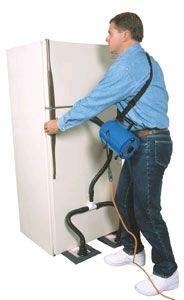 The Air Lifter includes: 2 appliance movers, T-Connector, 3 hoses & strap, carrying bags, 2 H.P. blower, and carpet slider adaptor kit. * Please call us for any questions on our airlift appliance mover air lifter 800 rentals in Eden Prairie Minnesota, Bloomington, Chanhassen, Minnetonka and surrounding Twin Cities communities.